Fall weather has been beautiful and is a great time to fish the lakes. Round Lake produced some nice cutthroat on a dry fly this week. 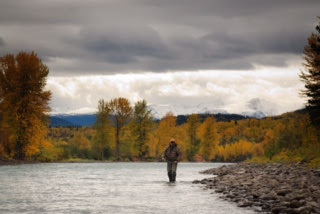 Bulkley is in fantastic shape and fishing has been good for most. Still nice Coho being caught around Moricetown.Coho retention ends October 15th. Morice River is also looking great. Fish still being caught on the dry fly. Kispiox is looking great and fishing decent. Kitimat River is in great shape and there are lots of Coho. Still some fresh ones, but others are starting to turn color. Skeena is looking great and fishing good. Quite a few Coho being caught around China Bar. Heavy rains forecasted later this week. 6:30. Wednesday, October 14th, at Oscar's Source for Adventure. Senior Fisheries Biologist Mark Beere talking Steelhead.